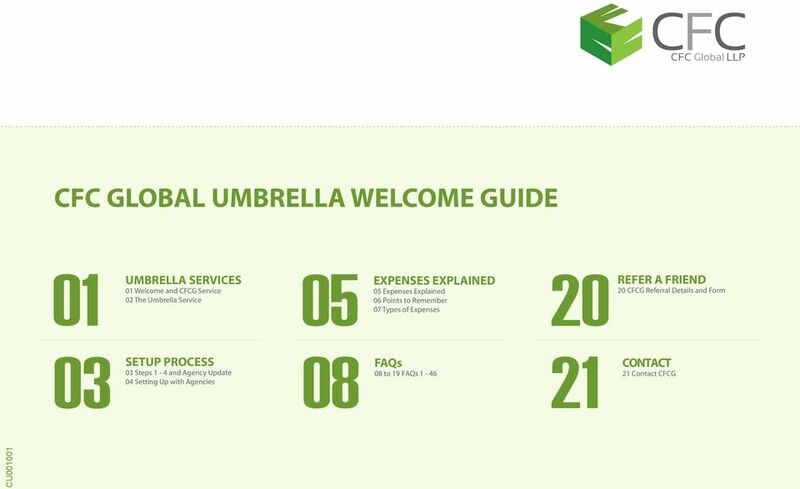 Download "CFC CFC GLOBAL UMBRELLA WELCOME GUIDE. SETUP PROCESS 03 Steps 1-4 and Agency Update 04 Setting Up with Agencies. CONTACT 21 Contact CFCG"
4 1. You sign up with CFC Global and we send you our contract. 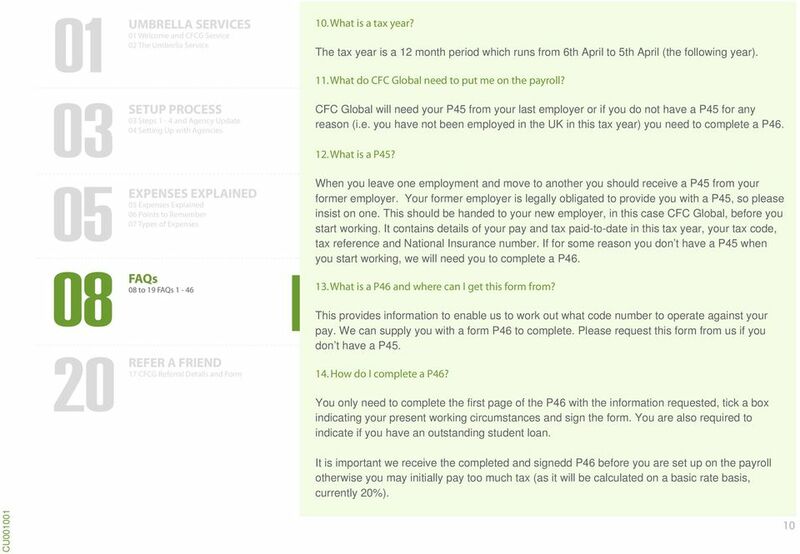 You will need to sign and return the contract along with: Expenses Explained to proof of identity (original passport) - eligibility to work in the UK (and VISA page if applicable) - proof of current address (recent utility bill or bank statement - original documents) - form P45 from your previous employer (if applicable) or a completed and signed for P46 - form P86 (where applicable) - the 48 hour working week opt-out agreement (optional) - the conduct of employment agencies and employment businesses regulations opt-out agreement (optional) 2. You submit your timesheets to us and to your agency, and submit and provide to us, proof of the details of the expenses that you incurred in the performance of your duties. 3. We will raise and send an invoice to your Agency / End Client for payment 4. 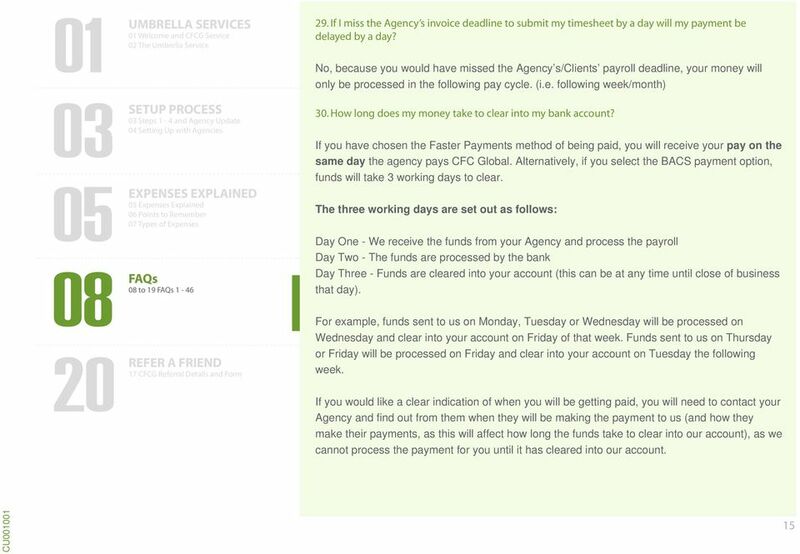 Once funds are received by us, we calculate your expenses and process your payroll ON THE SAME DAY and transfer your net pay directly into your bank account. Every time you get paid we will send you complete details of your payment and deductions in the form of payslips. 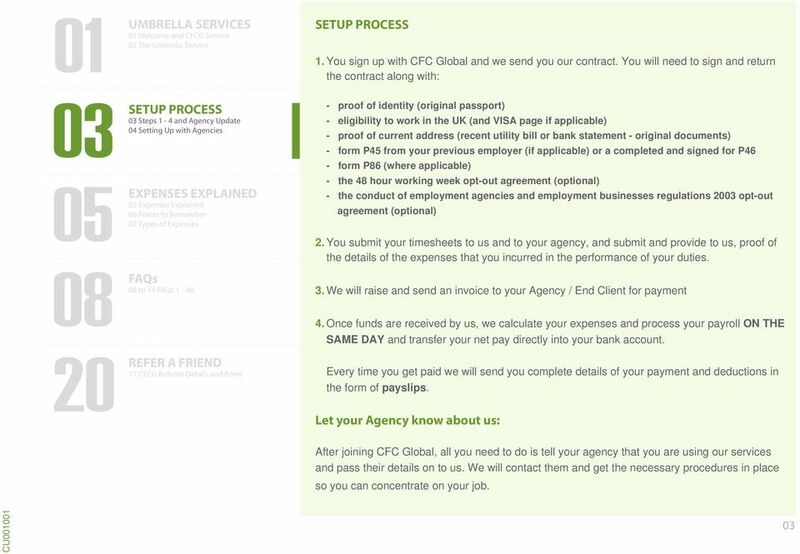 Let your Agency know about us: After joining CFC Global, all you need to do is tell your agency that you are using our services and pass their details on to us. We will contact them and get the necessary procedures in place so you can concentrate on your job. 6 Expenses Explained One of the biggest advantages you have being a contractor is being able to claim tax-free expenses. You will probably incur business expenses as you perform your duties as a contractor. 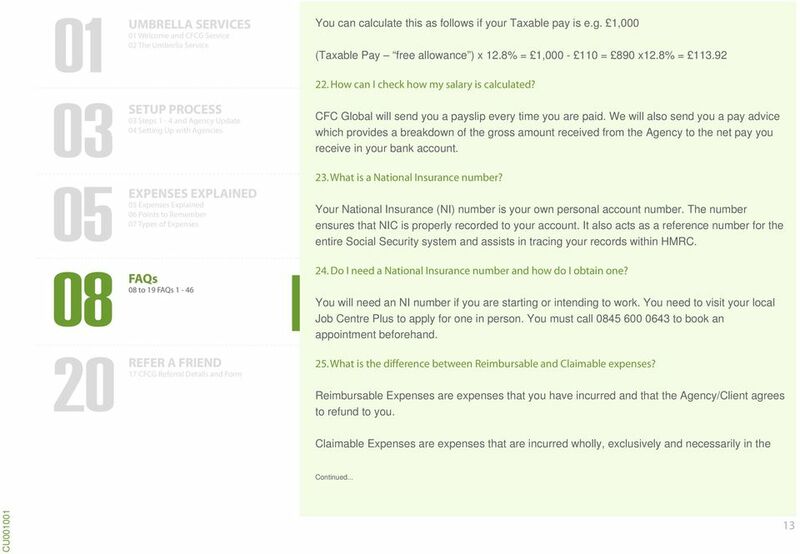 By using the services of CFC Global you will be able to claim tax relief on these expenses. This greatly reduces the amount of tax and national insurance that you pay and puts more money in your pocket. Make the most out of contracting by claiming properly allowable business expenses. It will make a great deal of difference to the net amount that you receive each week. Make sure you claim what is rightfully yours. How much can you claim? to There's no limit as to how much you can claim, except that: your expenses must be incurred wholly, exclusively and necessarily in the performance of your duties your gross taxable pay does not fall below the National Minimum Wage Note that tax free expenses are not paid to you as an extra payment over and above the amount received from your Agency. We simply offset them against your gross pay and in doing so reduce the amount of tax and national insurance that you pay. The result is more take home pay! 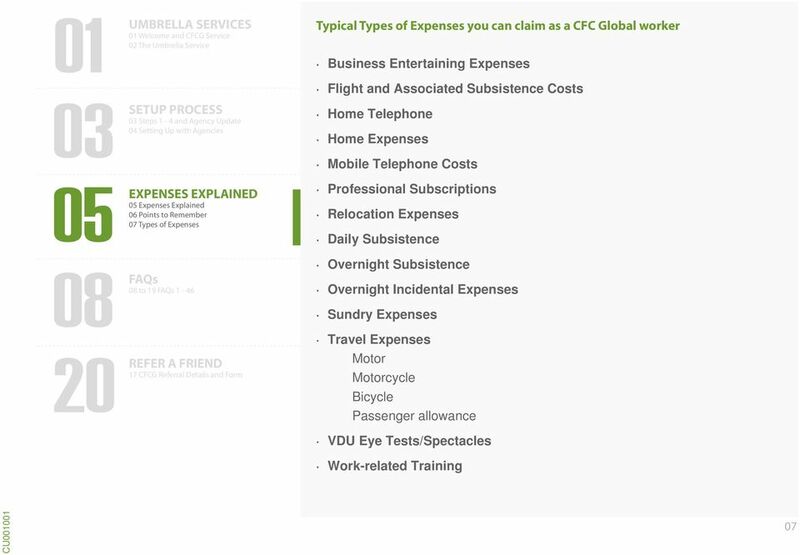 Again, simplicity works: It could not be easier to claim expenses through CFC Global. 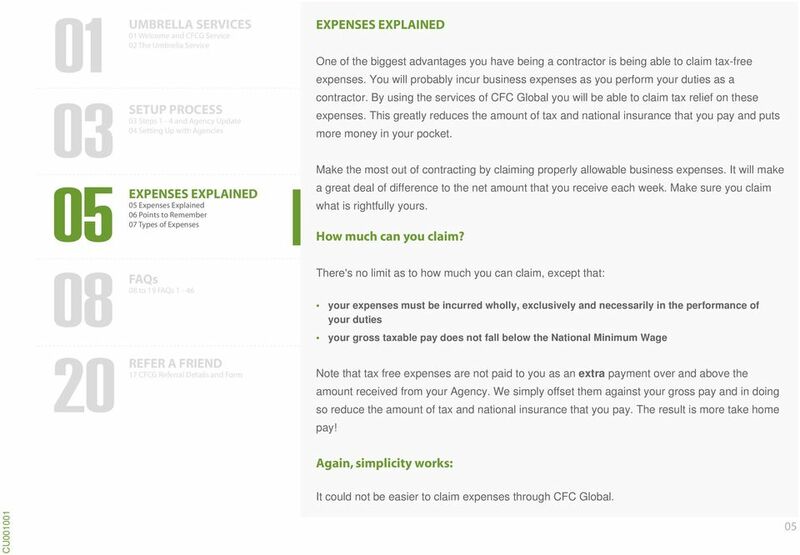 9 Expenses Explained to FREQUENTLY ASKED QUESTIONS 1. 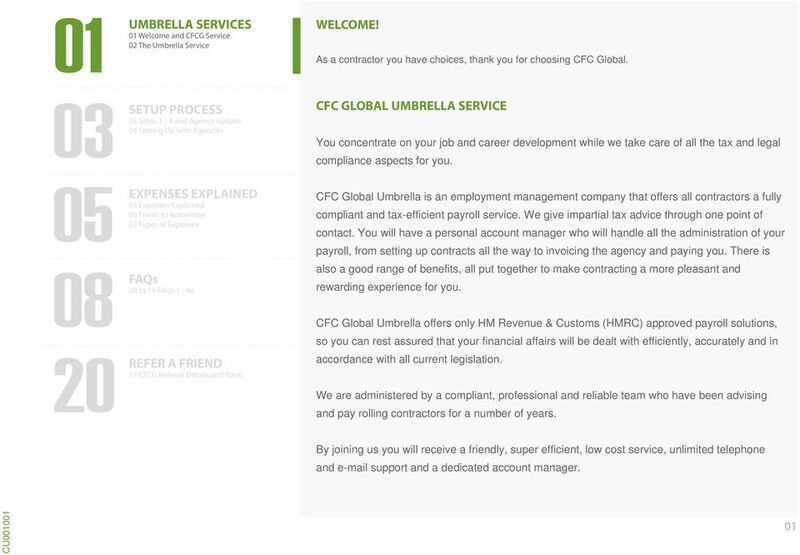 What is an Umbrella Company? 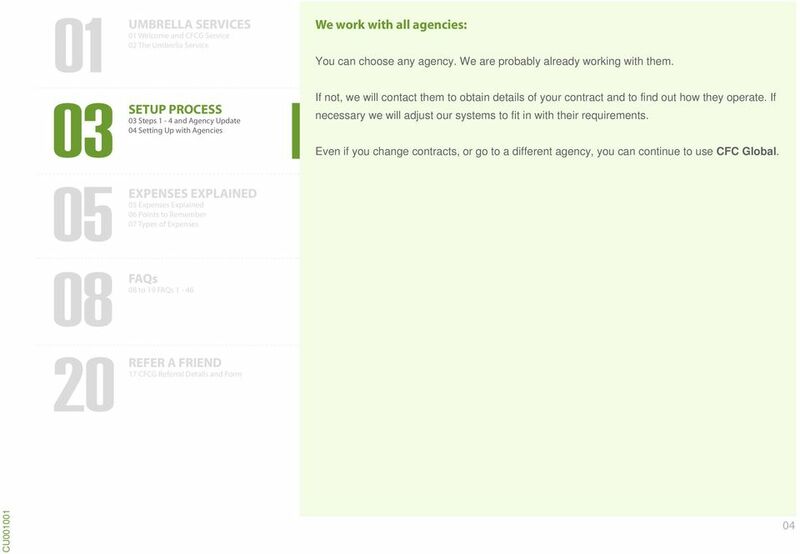 If you are contracting, including if you have secured a contract with the help of an Agency, you will be able to maximise your pay by opting to work through an Umbrella Company. 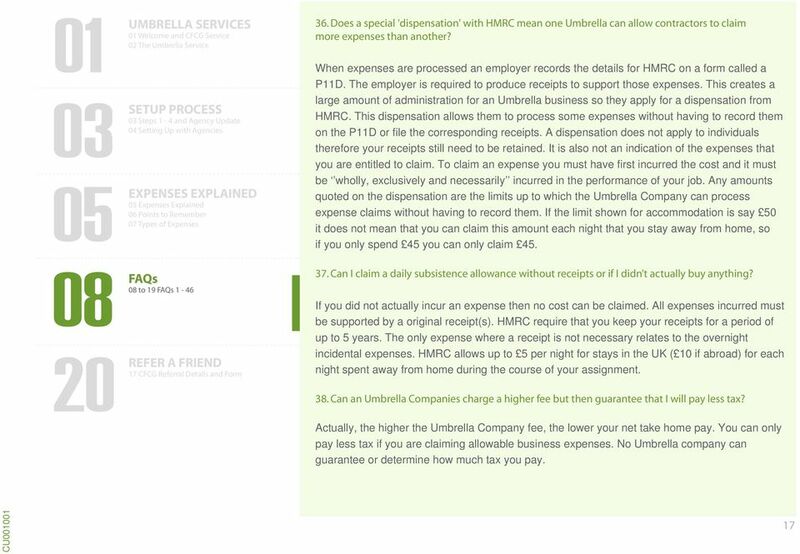 The purpose of an Umbrella Company is to make life simpler for contractors by taking care of the tax, payroll, compliance and administrative affairs whilst helping them maximise their earnings by reducing the amount of tax they pay. 2. 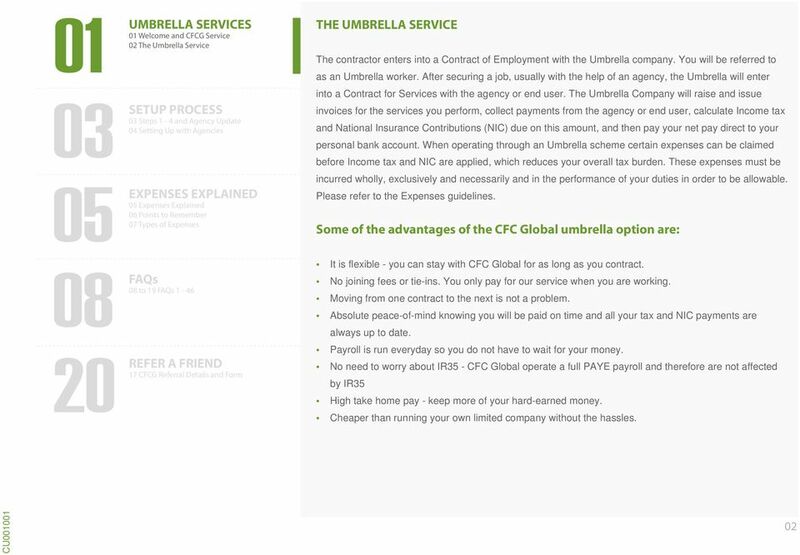 How does an Umbrella Company work? 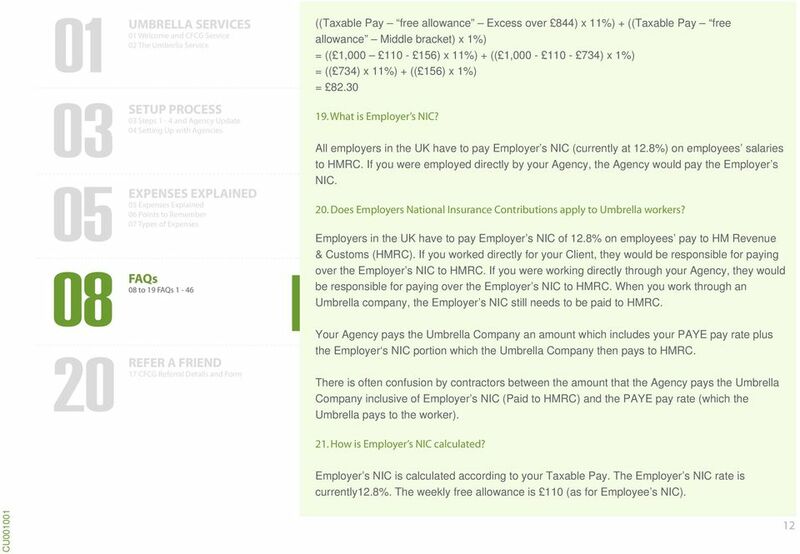 The Umbrella Company is your employer and allows you to choose temporary contracts. 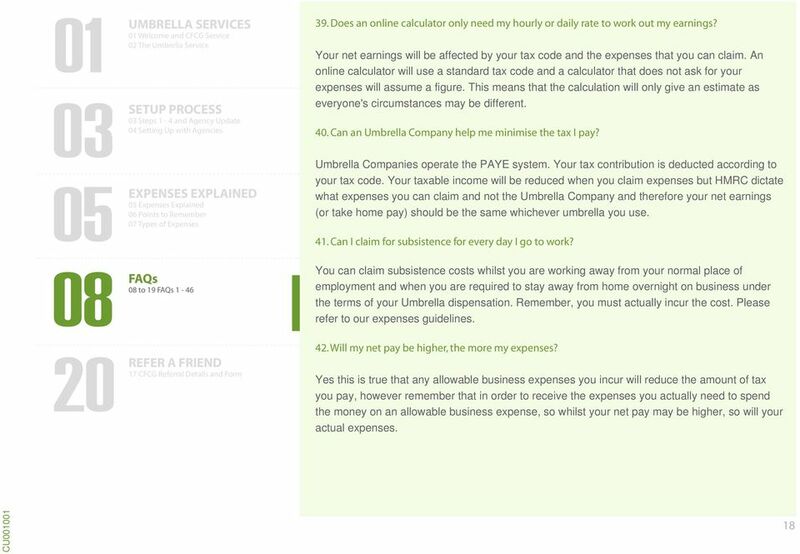 The Umbrella Company s Expenses Policy will allow you access to tax deductions for a range of business expenses incurred. 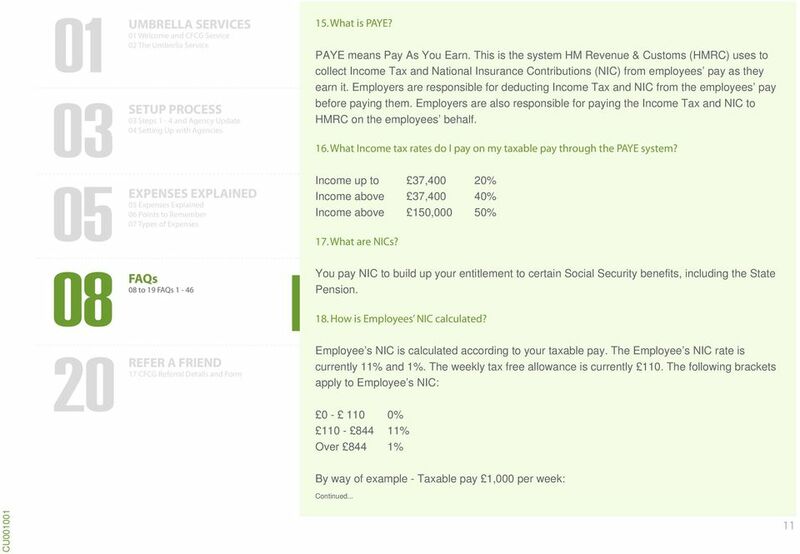 This greatly reduces the amount of income tax and National Insurance Contributions (NIC) that you pay and puts more money in your pocket. 3. 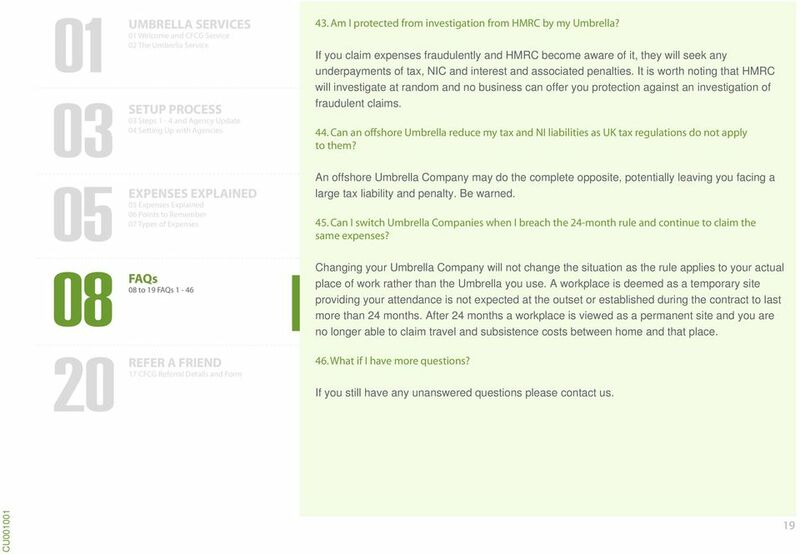 Does it cost anything to work through an Umbrella Company? 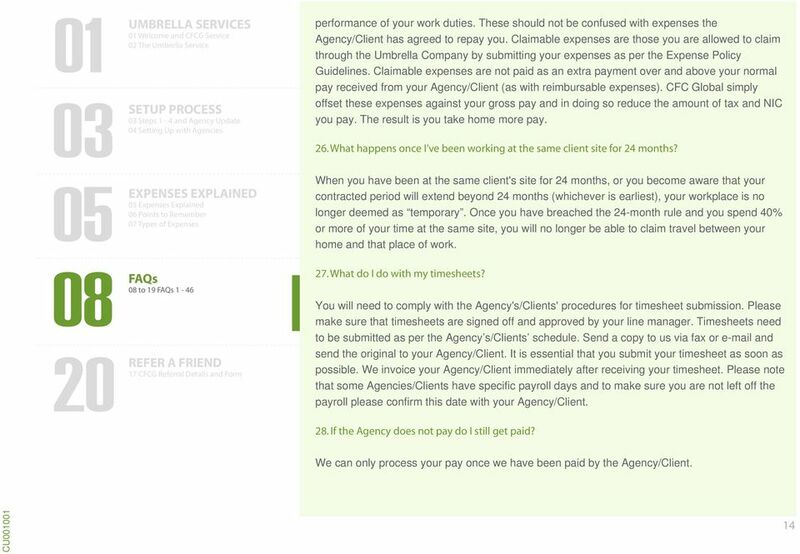 The Umbrella Company charges you a fee for the provision of its service, but you are still better off than someone who is working directly through an Agency or in permanent employment. 4. 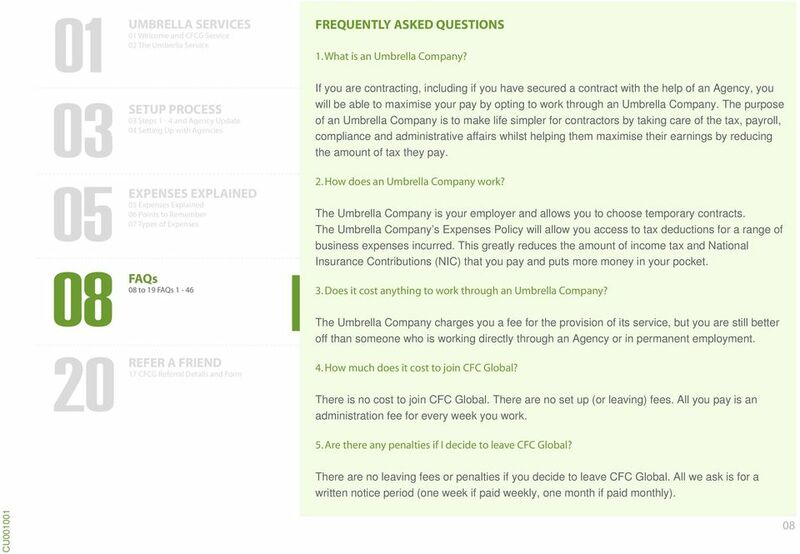 How much does it cost to join CFC Global? There is no cost to join CFC Global. There are no set up (or leaving) fees. All you pay is an administration fee for every week you work. 5. 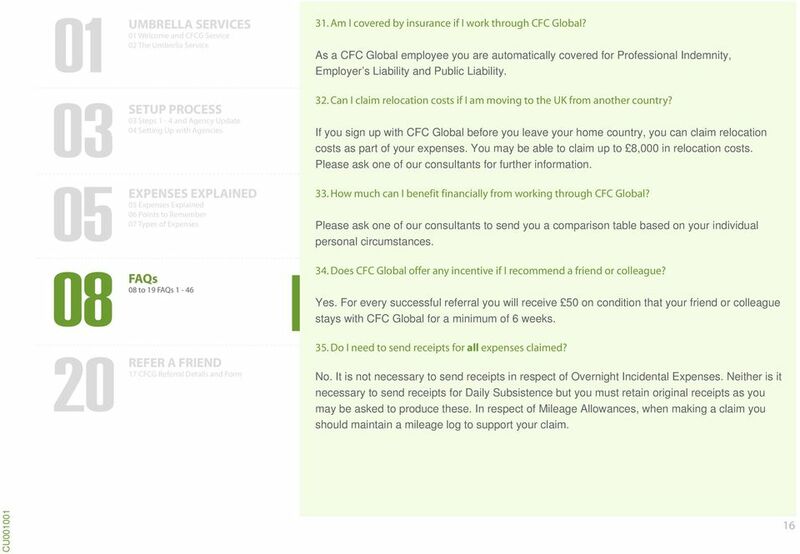 Are there any penalties if I decide to leave CFC Global? There are no leaving fees or penalties if you decide to leave CFC Global. All we ask is for a written notice period (one week if paid weekly, one month if paid monthly). 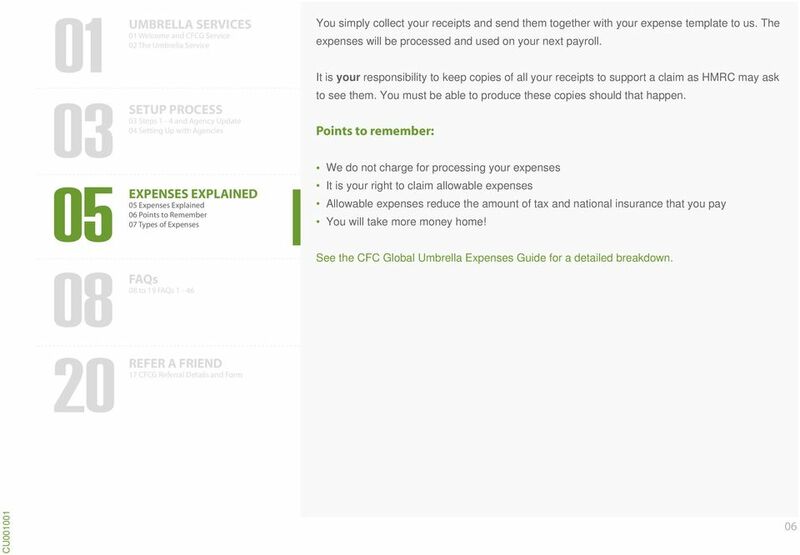 21 Expenses Explained Refer a friend or colleague to umbrella freedom: If you know anyone who could benefit from our services, tell us who they are and if their application is successful we will reward you for your efforts: Individuals and Agency Consultants can benefit from 50 per successful referral After your referral has worked with us for 6 weeks, simply print out the form below, complete it, and send it to us. We will contact you to obtain your personal banking details to make the referral payment. All fields marked with an * must contain information before the form data can be successfully processed. to CFC GLOBAL RAL FORM Your Full Name* Your Address* Referree s Name* Referree s Telephone Number (incl. STD code) Referree's Address* Referral - Terms & Conditions By submitting this form, you agree to the following referral terms and conditions: Referrals will not qualify if CFC Global has been in contact with the referred candidate at any time prior to the referral being made. Where the candidate is introduced by more than one person, we will operate a first come first served policy. The candidate must be paid through us for 6 weeks in order to qualify. In the event of any disputed fees, CFC Global decision will be final.